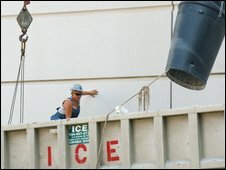 US employers cut 216,000 jobs in August, pushing the unemployment rate up to 9.7%, a 26-year high, official figures show. The unemployment rate rose after dipping to 9.4% in July but the Labor Department said the job loss figure was the smallest in a year. Since the start of the recession in December 2007, the economy has shed 6.9 million jobs, the department said. Jobs have been lost across manufacturing and service industries. Total unemployment stands at 14.9 million. Analysts had expected the unemployment rate to rise to 9.5% and job reductions to total 225,000. Although there have been signs that the US economy is now recovering from the worst recession in 70 years, unemployment has remained high and could dampen any economic rebound. However, Nigel Gault, chief US economist at IHS Global Insight, said that the rise in the jobless rate was not too discouraging. "The decline last month was too good to be true, really. It's too early for the unemployment rate to be coming down, of course we're still losing jobs," he said. "What I would take encouragement from is the fact is the trend in the rate of decline in jobs is still improving, that private sector jobs were down 198,000, that's 50,000 better than the previous month and it's almost 200,000 better than the month before that." Most cuts were seen in the construction industry, with 65,000 jobs lost in the month.